Steroid hormones play a central role in the maintenance and progression of prostate cancer. The androgen receptor is the primary driver of tumor cell proliferation and is activated by the androgens testosterone and 5α-dihydrotestosterone. Inhibition of this pathway through medical or surgical castration improves survival in the majority of advanced prostate cancer patients. However, conversion of adrenal androgen precursors and alternative steroidogenic pathways have been found to contribute to tumor progression and resistance to treatment. The emergence of highly accurate detection methods allows us to study steroidogenic mechanisms in more detail, even after treatment with potent steroidogenic inhibitors such as the CYP17A1 inhibitor abiraterone. A clear overview of steroid hormone levels in patients throughout the local, metastatic and castration-resistant stages of prostate cancer and treatment modalities is key toward a better understanding of their role in tumor progression and treatment resistance. 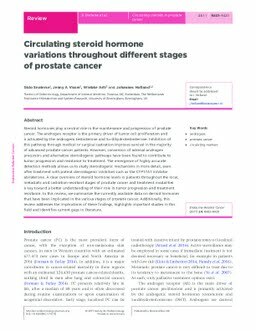 In this review, we summarize the currently available data on steroid hormones that have been implicated in the various stages of prostate cancer. Additionally, this review addresses the implications of these findings, highlights important studies in this field and identifies current gaps in literature.